Famous poet Carl Sandburg was also a collector of American folk music. He compiled around 290 songs in this anthology, which contains singable words and music, including harmonies or accompaniment. NY: Harcourt Brace. Very Good-. 1927. Hardcover. Rubbed at the spine ends and corners. Stained at the very top. Visible on the outer edge and the upper edge of the pages. Inscribed by Sandburg on the half-title. I guarantee the signature to be authentic. ; Small 4to 9" - 11" tall; 495 pages; Signed by Author . 2015-02-14. New. Ships with Tracking Number! INTERNATIONAL WORLDWIDE Shipping available. Buy with confidence, excellent customer service! 2011-01-08. Good. Ships with Tracking Number! INTERNATIONAL WORLDWIDE Shipping available. May not contain Access Codes or Supplements. May be ex-library. Shipping & Handling by region. Buy with confidence, excellent customer service! New York: Harcourt Brace And Co. Good with no dust jacket. 1927. Hardback. Worn and soiled black HB with red lettering and small illustration of Sandburg on front and red lettering on upper spine/red; 495 pages; Book edges/some white abrasions on front cover . 1990-07-08. New. Ships with Tracking Number! INTERNATIONAL WORLDWIDE Shipping available. Buy with confidence, excellent customer service! 2017-08-25. Good. Ships with Tracking Number! INTERNATIONAL WORLDWIDE Shipping available. May not contain Access Codes or Supplements. May be ex-library. Shipping & Handling by region. Buy with confidence, excellent customer service! 2015-05-01. Good. Ships with Tracking Number! INTERNATIONAL WORLDWIDE Shipping available. May not contain Access Codes or Supplements. May be ex-library. Shipping & Handling by region. Buy with confidence, excellent customer service! New York: Harcourt, Brace & Company. Near Fine with no dust jacket. 1927. First Printing. Hard Cover. Publisher's full black cloth, orange lettering on spine, orange lettering and portrait medallion on cover, all edges orange. The American Songbag is an anthology of American folksongs compiled by the poet Carl Sandburg and published by Harcourt, Brace and Company in 1927. It was enormously popular and was in print continuously for more than seventy years. According to the musicologist Judith Tick: As a populist poet, Sandburg bestowed a powerful dignity on what the 20s called the "American scene" in a book he called a "ragbag of stripes and streaks of color from nearly all ends of the earth ... rich with the diversity of the United States." Reviewed widely in journals ranging from the New Masses to Modern Music, The American Songbag influenced a number of musicians. Pete Seeger, who calls it a "landmark", saw it "almost as soon as it came out." The composer Elie Siegmeister took it to Paris with him in 1927, and he and his wife Hannah "were always singing these songs. That was home. That was where we belonged.". One small white spot on cover, else fine; unmarked, tight, square, and clean. NEAR FINE. . 4to 11" - 13" tall. xxiii, 495 pp . New York: Harcourt, Brace & Company, 1927. Early printing. Hardcover. Good. 495pp. Quarto [26.5 cm] in red cloth with gilt-stamped spine. Fading to spine, corners and other portions of extremities exposed, light fraying; binding cracked (but holding) at title page; moderate musty scent. Wallace Stegner's ink name on front free endpaper, above bookplate of son Page Stegner. Poet Sandburg has gathered 280 American folk songs, with music, many of which had not been published prior to this collection. Harcourt Brace (Canada). Hardcover. 0544309782 New Condition. . New. Harcourt Brace (Canada). Hardcover. 0544309782 Like New Condition. . Fine. 1st Edition. Hardcover. (Very Good or better unless otherwise noted). 1st Edition, NY (1927), 4to, 495p. New York: Harcourt Brace and Company, 1927. First state, folio size black buckram cloth with orange titles and woodcut portrait of Sandburg on cover and single 1927 date on the copyright page. A very well preserved copy, clean and unmarked. Out of print.. First Edition. Hard Cover. Near Fine. Quarto. NY: Harcourt, Brace & Company. Very Good in Very Good dust jacket; Top front corner bumped, owner name . and date on front free endpaper, jacket rubbed, edges lighly chipped.. 1927. Later Printing. Hardcover. Red cloth. xxiii, 495 pages. Black and white illustrations, musical notations, and index. Classic description of 280 American musical examples of spirituals, ballads, and hobo songs. ; 4to 11" - 13" tall . New York: Harcourt, Brace & Company, . Hardcover. Quarto (26.5cm. ); original cloth in red pictorial price-clipped dust jacket; xxiii,,495pp; lyrics and notation throughout. Jacket extremities a bit rubbed with minor shallow chipping, spine a hint sunned, dampstain at bottom fore-ege corner of textblock not bleeding into text, ownership gift inscription to front free endpaper, else Very Good and sound. Presumed reprint: from the upper jacket flap, "The original published price of this book was $7.50. Its great success and its assured popularity make possible its republicaiton in this new low-priced edition." 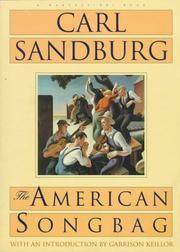 Comprehensive anthology of American folksongs compiled by Sandburg. New York: Harcourt Brace & Company, 1927. Very clean in sound binding. Near fine in poor chipped and torn, though largely intact, dust jacket. New Brodart cover on dj. Heavy book may require additional postage. . First Edition. Hard Cover Cloth. Near Fine/Poor. 4to - over 9¾" - 12" tall. NEW YORK: HARCOURT BRACE. VG. 1927. FIRST. BOOK HAS ONE CORNER BUMPED AND SOME FADING TO THE SPINE . Harcourt Brace Jovanovich. Paperback. 015605650X Please allow 4 - 14 business days for Standard shipping, within the US. Thank you for supporting our small, family-owned business! . Fine. 1990-10-29. 1st. Harcourt Brace Jovanovich. Paperback. 015605650X Please allow 4 - 14 business days for Standard shipping, within the US. Thank you for supporting our small, family-owned business! . New. 1990-10-29. 1st. Franklin Classics. Hardcover. 0343127857 Special order direct from the distributor . New. Harcourt Brace (Canada). Hardcover. 0544309782 Special order direct from the distributor . New. NY: Harcourt Brace, 1927. First edn. Large 8vo, pp. 405. A fair copy (cloth torn at the top of the spine), in well worn dj. Johnson p. 455. The words and music to 280 songs and ballads, with commentary. Mariner Books, 1990-10-29. Rei Sub. Paperback. Used:Good. Harcourt, Brace & Co, 1927. Book. Very Good. Hardcover. 2nd printing with "2" on copyright page. In black cloth. Couple ink words on front endpaper..
Harcourt Brace Jovanovich. PAPERBACK. 015605650X Special order direct from the distributor . New. Harcourt Brace (Canada). Hardcover. 0544309782 Remainder mark . Fine. Harcourt Brace (Canada). Hardcover. 0544309782 . New. 1990-07-08. Good. Ships with Tracking Number! INTERNATIONAL WORLDWIDE Shipping available. May not contain Access Codes or Supplements. May be ex-library. Shipping & Handling by region. Buy with confidence, excellent customer service! Harcourt Brace & Company. Used - Good. Good condition. New York: Harcourt, Brace & Company, n.y.. Hardcover. Small 4to. Red cloth with gilt spine lettering. xxiii, 495pp. Very good. Faint edgewear, with spine lightly sunned. A tight and nice later printing of this famed 1927 folk music anthology. Harcourt, Brace & Co. B0000D2QRL Crisp pages. Tight binding. Includes protective cover. Moderate shelf wear on dust jacket. Edges are slightly dirtied. Light tanning. . Very Good. New York: Harcourt, Brace & World, 1927 This book is in good condition. The interior is clean. This is a school library copy with as many of the library markings removed as possible. There is a pocket on the last page. There are tape marks on the inside of the covers. The dust jacket is in good condition with wear along the edges and a faded spine. Jacket illustrations by Beth Krebs Morris in black and red and white.. Hardcover. Good/Good. 4to - over 9¾" - 12" tall. Music. Harcourt Brace Jovanovich. Paperback. 015605650X Please allow 4 - 14 business days for Standard shipping, within the US. Thank you for supporting our small, family-owned business! . Fair. 1990-10-29. 1st. New York: Harcourt, Brace & Company, 1927. Good. Later printing. Quarto. 495pp. Black-stamped peach cloth. Pages lightly age-toned, cloth faded and soiled, good only. Two hundred and eighty songs, ballads, ditties from all American regions. Harcourt, Brace and Company, 1/1/1927. Hardcover. Very Good. 3rd printing. Hardcover. No dust jacket. Good binding and cover. Clean, unmarked pages. This is an oversized or heavy book, that requires additional postage for international delivery outside the US. BiblioBazaar, 2011. Paperback. Good. Disclaimer:A copy that has been read, but remains in clean condition. All pages are intact, and the cover is intact. The spine may show signs of wear. Pages can include limited notes and highlighting, and the copy can include previous owner inscriptions. An ex-library book and may have standard library stamps and/or stickers. At ThriftBooks, our motto is: Read More, Spend Less.Dust jacket quality is not guaranteed. Harcourt, Brace, New York, n.d. 17th impression. 4to. hardcover. 495pp. index. Very good+. / Good d/w with faded spine and bottom edge & chipped corners. .
Harcourt, Brace & Co., New York, 1946,. 1946. Hardcover. hardback, 4to, 495pp, edges slightly browned, owner's bookplate on endpaper, contents clean and tight, red cloth, board corners bumped, Good / no dustwrapper . Harcourt Brace Jovanovich. PAPERBACK. 015605650X Softcover. Very Good with shelf/age wear. Free of any markings and no writing. For Additional Information or pictures, Please Inquire. . Very Good. New York : Book-of-the-month, 2003. Paperback. Near Fine. Musicians, educators, and youth leaders should have special interest in this book, which is as pure a piece of Americana as Duncan Emrich's Folklore On The American Land. The American Songbag will also thrill lovers of Americana and those searching for a legitimate, productive, and useful avenue into our country's history. Highly recommended for all audiences. Paperback. Pictorial cover. xxix, 495pp., index. Full refund if not satisfied. New York: Harcourt Brace & World, 1927. [N.11.62]. Quarto; good+/fair+; dj, red spine with black text; HB, red cloth spine with gilt lettering; ex libris, signature; minor shelf wear and bumping; text block clean; 493 pp. ; boards, minor flaking; binding shaken; dj, multiple open and closed tears, creases, and wear; sunned; spot staining; else very good. Shelved Rockville Bookstore. New York: Harcourt, Brace & Company. Very Good- with no dust jacket. 1945. Hardcover. Spine ends compressed / bumped. ; Small 4to 9" - 11" tall; 495 pages . Harcourt, Brace and Company. Hardcover. B000OKRBTY Good, hardcover binding with no dust jacket. Light to moderate wear to corners and edges, clean text, may contain previous owner?s signature, remainder mark, sticker/residue, or other minor aesthetic flaws. Please inquire for additional details. Last Word Books & Press is an Infamous Independent Bookstore and Print Shop located in Olympia, Washington. . Good. Harcourt, Brace & Company, 1927. 3rd printing. Hardcover. Very Good. Well worn ex-library copy with marking to the endpapers, spine, and title page, sold as a reading copy only. Quarto, 10 1/2" tall, xxiii + 495 pages with intertextual illustration, decorative brown cloth. A good copy only, covers worn through cloth at the corners, some exterior soiling, hinges cracked binding shaken, but all still in one piece as is and quiet useful. Lacking dust jacket. Mariner Books, 1990-10-29. Paperback. Good. Harcourt Brace Jovanovich. Paperback. 015605650X Ex-library book with usual markings. Clean text. SATISF GNTD + SHIPS W/IN 24 HRS. Sorry, no APO deliveries. Ships in a padded envelope with free tracking. P26G g . Good. 1990-10-29. 1st. Harvest Books. Used - Very Good. Great condition for a used book! Minimal wear.